The Belgard, the premier luxury residential apartment building in D.C.’s exciting NoMa neighborhood, is now open — and leasing up fast! If you are looking for apartments in Northeast D.C., you don’t want to miss the opportunity to experience the height of life in this exceptional property. With brand new apartment homes, featuring refined amenities and never-before-seen community offerings, The Belgard is a visionary place to live in the heart of Washington, D.C.’s vibrant NoMa neighborhood. Looking for an apartment from out of town? View our floor plans and contact us to schedule a virtual tour of the property with our personal concierge. We will walk you through our bright, open floor plans featuring distinctive details and top-tier elements, including GRAFF chrome fixtures, Caesarstone® countertops, cast-iron bathtubs for perfect serenity, keyless entry for ultimate convenience, and floor-to-ceiling windows. The tour doesn’t stop there — envision yourself enjoying our peerless community amenities as we guide you through the resort-style rooftop complete with an infinity-edge saltwater pool, cabanas, and grilling stations, the “speakeasy” complete with draft beer and liquor lockers, the custom-build arcade, and more. View the artistic details around every corner, from the exotic saltwater aquarium to the custom, curated art collections on every floor. And we didn’t forget your four-legged friends: learn about our animal-lover pet program, including a state-of-the-art pet spa, pet grooming services, and dog walking services. Looking for that minimalist lifestyle? There are only a limited number of our micro units left! 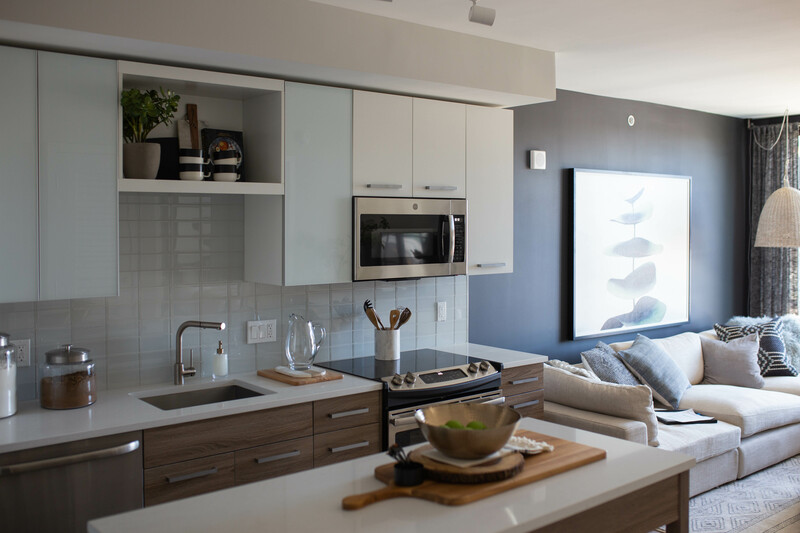 At 374 and 386 square feet (some of the most streamlined residences available in the area), our micro units are leasing up quickly — tour today! Residences are filling up fast, so schedule your tour today and discover how you can elevate your life at The Belgard and receive one month’s rent free. We look forward to seeing you soon!